Recently I decided to re-introduce myself into the world of colour correcting, by where I put odd coloured concealers on my face to cover other odd colours on my face! 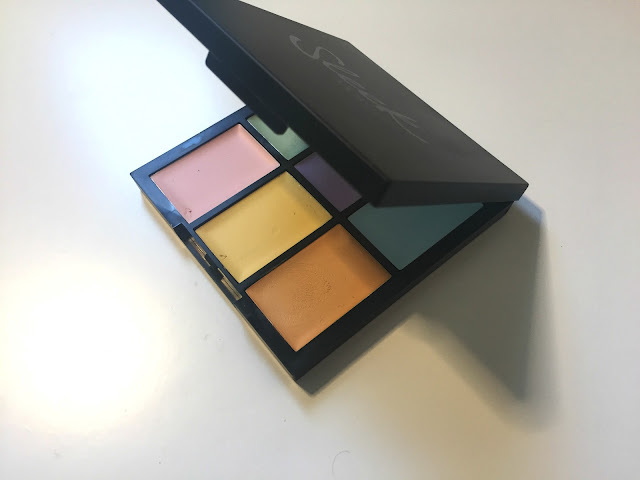 I saw that sleek had a new colour correcting palette out and after seeing a few people use it in the blogger world I decided I would give it a go too. Green- neutralises red tones - I use this on my cheeks and around my nose. Blue - neutralises orange - good to use over freckles or any orange toned pigmentation spots - not a colour shade that I use. Pink - adds radiance and can be used to brighten age spots - this is not a colour I use personally. Yellow - neutralises purple and blue on lighter skin tones - this can be used on prominent veins or under eye area. personally I use the orange for this as it just works a bit better for me. Orange - neutralises blue can be used on under eyes especially on medium skin tones. The consistency of these cream concealers is great, they are not drying on my skin and they have a good pigmentation level meaning they really help to counteract all my skin pigmentation issues. I mean sure I look crazy until I get my foundation on - but my foundation looks loads better for colour correcting! It really stops the redness peeking through my foundation and my eye area just looks better with a bit of colour correcting going on - its not as dark and tired looking!